We envision a world where breakthrough education innovations allow for all children to have access to effective learning opportunities. 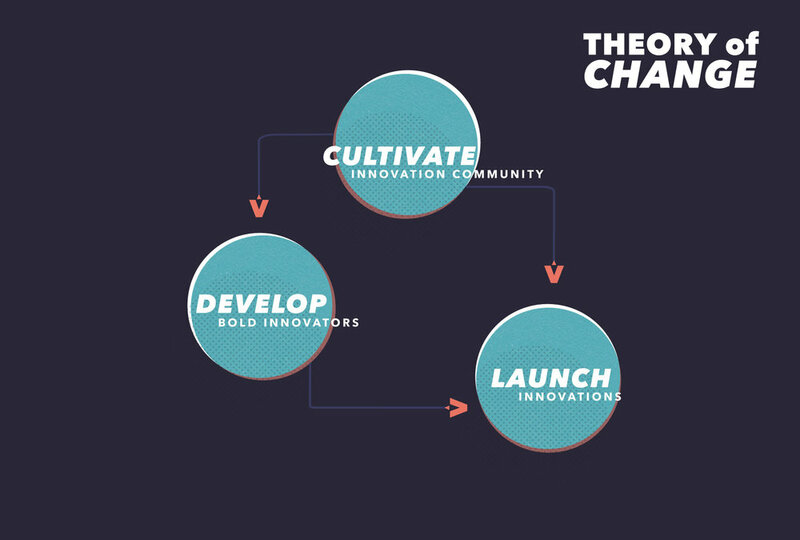 The LEANLAB Theory of Change is the framework we use to achieve meaningful education innovation. The theory can be broken down into three distinct but interdependent parts and community is integral to all three parts functioning. We believe the key to effective education innovation is listening to the community; our Theory of Change is designed to involve the community and solicit their feedback at every step of the innovation process. LEANLAB cultivates an innovation mindset and fosters community among all key stakeholders in education. We use monthly meetups to spark action oriented ideas for innovations and bring together parents, students, teachers, entrepreneurs, and education leaders. Our goal is to engage a diverse set of stakeholders and give them the tools to pinpoint specific problems and design innovative solutions. We believe the best solutions to the most complex problems facing education will come from those most impacted by these problems and we want to give them the resources to build viable solutions. The next step in bridging the achievement gap is our focus on education innovators. We offer first-class, tactical training for aspiring innovators whether they’re at the idea-stage or already have a viable product. We use our Innovation Workshops and the K12 Fellowship to offer training and in-depth feedback for innovators. Our weekend Innovation Workshops are held quarterly and serve as an introduction to lean methodologies and design thinking. Participants learn prototyping and testing; many go on to further develop their ideas in our fellowship. The K12 Fellowship is an intensive, four-month program where founders will hone their ideas through mentorship and direct community feedback in order to create a prototype that will be tested in beta-site school in Kansas City, Missouri. After four months of training, our fellows will have a viable prototype and will be ready to launch their innovation into an at-need beta-site school in Kansas City. The beta-sites are diligently chosen and align with appropriate innovations. We also provide our fellows with early seed-funding, and partnerships with later-stage incubators and funders to sustain their innovations. Results from the beta-sites are carefully measured and disseminated to fellows after the launch. Education in Kansas City today is unequal. Just one in three of our public school students reads on grade level, and inequities are most pronounced for children of color. Last year’s achievement statistics belied a grave injustice: while nearly 60% of white students scored proficient in English Language Arts in 2017, just 30% of the district’s African-American students and 40% of Latino students did. Dedicated people are fighting for change--but progress is far too slow. Four years ago, a report found that if the district sustained its then-present rate of academic growth, it would take more than 20 years to bridge the English Language Arts proficiency gap between Kansas City and Missouri at large. Today—nearly half a decade later—growth patterns remain mostly stagnant. Faced with this challenge, schools turn to “best practices” developed more than a century ago; fear of falling even further behind stifles innovation. Meanwhile, the voices of those most impacted by the inequities—parents, students and educators—aren’t being heard. These are the real experts in this space, but they haven’t being given the chance to engage.